Hassan Zahir Wali filed a lawsuit in Bangladesh Agricultural University on December 16, 1995, in connection with the murder of three Islami Chhatra Shibir men. From then onwards, he was a target of those who had carried out the killings. 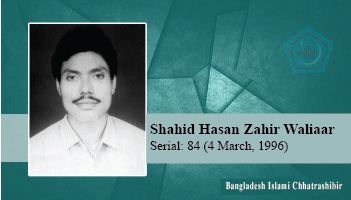 As a result, he attained martyrdom in a bomb attack in Mymensingh city's Shibir office on 4th March 1996. Shahid Hassan Zahir was a devoted associate of Islami Chhatrashibir. His dream was to join the martyr's caravan. Allah has fulfilled his dream of martyrdom.